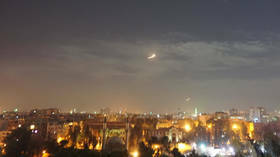 Syrian air-defense systems have repelled an attack in the skies over Damascus, state news agency SANA has reported. The Israeli Army said it was attacking "Iranian Quds" forces and warned the Syrian military not to retaliate. A military source cited by SANA said that Syrian air-defenses intercepted most of the Israeli missiles before they hit targets. The source added that Israel launched guided missiles from ground and air in several rounds. In a brief statement on Twitter, the Israel Defense Forces (IDF) warned the Syrian Army "against attempting to harm Israeli forces or territory." Witnesses on the ground reported hearing explosions above Damascus throughout the city. Images posted on social media show bright flashes in the sky as missiles were apparently destroyed mid-flight. Reports on social media indicated that Israel conducted several rounds of strikes over more than half an hour. The attacks reportedly proceeded deep into the night and stopped at around 2am local time. SANA, citing its own correspondent, reported that the missiles were flying over Lebanese territory and the Galilee Panhandle, the northernmost part of Israel, which borders Lebanon. Earlier on Sunday, Syrian air-defenses repelled another Israeli air raid. According to the Russian Defense Ministry, four Israeli F-16s launched guided missiles into Syrian territory. Seven missiles were intercepted, with no damage reported on the ground. Israel has been routinely attacking targets inside Syria that it claims belong to Iran, with the stated goal of preventing Iranian forces from gaining a foothold in the country. The airstrikes often go unacknowledged by the IDF, but in a recent interview outgoing IDF Chief of Staff Gadi Eisenkot revealed its true scale: "thousands of targets" hit in "near-daily" strikes, with 2,000 bombs dropped in 2018 alone.